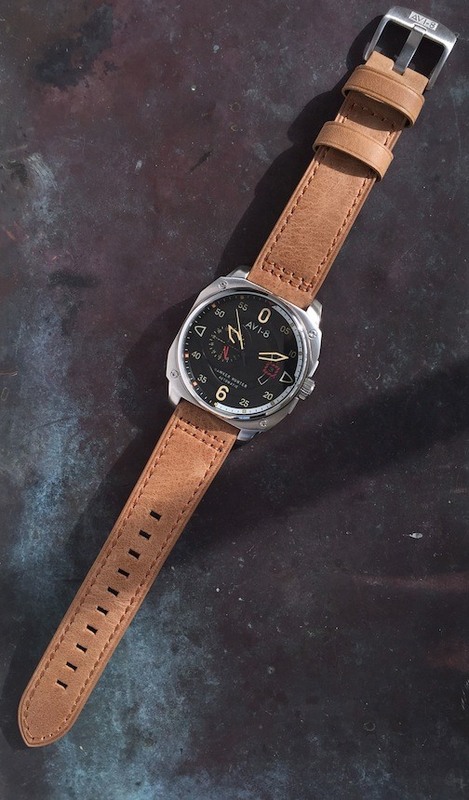 The AVI-8 Hawker Hunter Automatic watch was as unknown to me as the 1950s British jet by the same name. This automatic watch does not disappoint in keeping with AVI-8’s aviation designs that look like the watch was ripped off the plane’s instrument panel and given a leather strap. 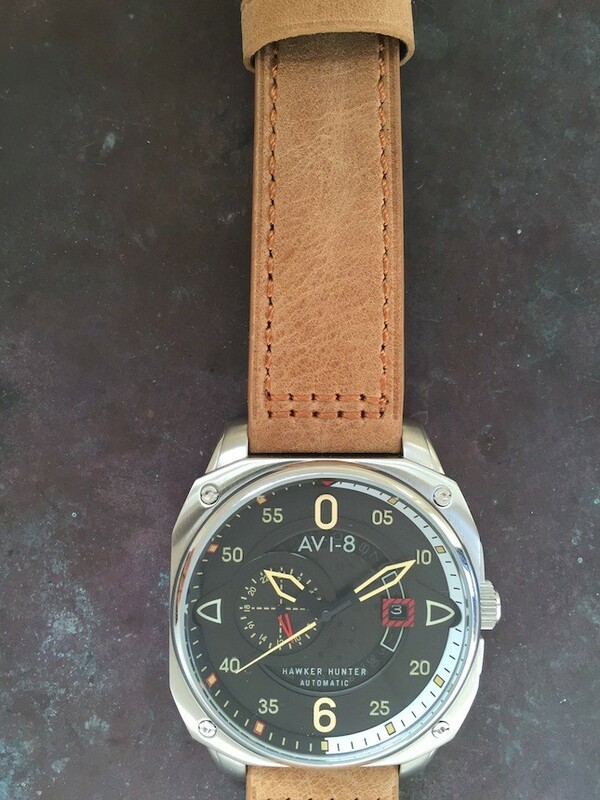 AVI-8, the watch company in England, has had some success designing unique aviation-themed watches like the Hawker Hurricane and Harrier. Let’s look at the AVI-8 Hawker Hunter now. 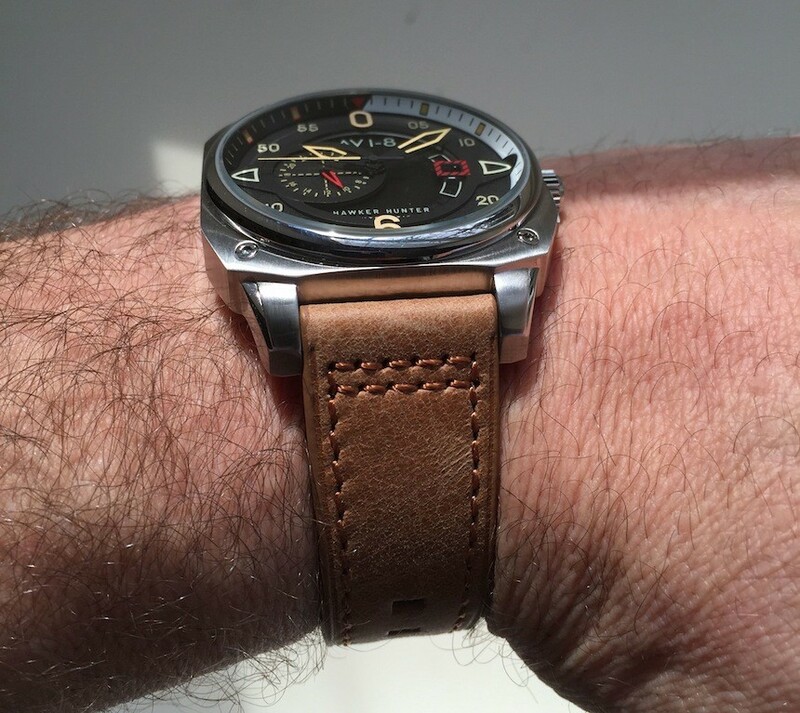 The AVI-8 Hawker Hunter’s stainless steel case landing on my wrist was like landing a big plane on an untried runway. The 44mm diameter case looks bigger in person even though its height at 11mm is not too tall. I usually don’t worry about the lug to lug dimension, but this one measures 54mm from lug to lug. For my 190mm (7.5”) wrist, it fits well although I have no watch in my collection at this size. Smaller wrists beware. Measure your runway for try to land this one. The round polished bezel gently glides down to a satin finished square case foundation. In the corners of this base are four subtle faux screw heads that reference the cockpit’s mounted instrument base. The dial’s most prevailing features include the modern skeleton-style hour and minute hands along with the 12 and 6 o’clock hour markers. The 12 o’clock marker, however, is a vintage-colored, looking 0. The 6 o’clock visually secures the bottom of the dial which marks each hour in five-minute increments. The 0 and 6 seem to float above the dial but still well below the outer-dial ring, which is clearly marked with 5 minute increments of Arabic numerals. The right side of the ring is white and the left side is in black and contrasts with the same off-white color markers framed in red. The next layer of the dial has the typical date window at 3 o’clock and is highlighted by red as well, except it is a red striped box. This red box element helps highlight and partially hide the date. At the 9 o’clock position is a 24-hour register that is subtle and guides you to the right 24 hour Arabic marker. This register hand is red, too, and a helpful guide. This hand is also luminescent, along with the hour, minute and second hand. 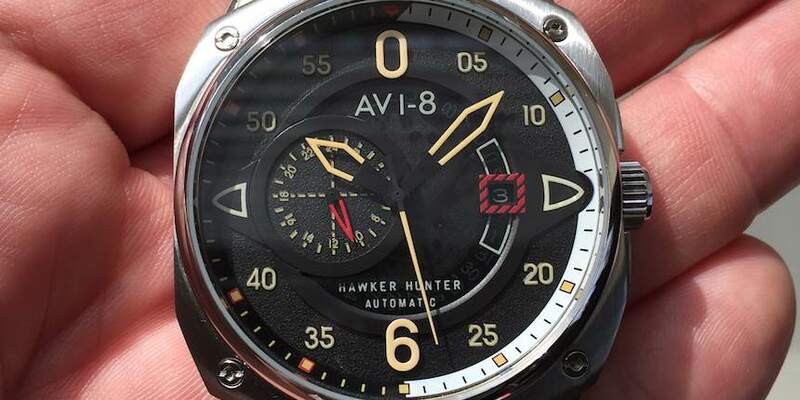 The “AVI-8” at 12 o’clock and “Hawker Hunter Automatic” are in white and positioned at 12 and 6 o’clock. I imagine the dial designer winced when the marketing person required all that type on the dial, but it really looks appropriate and not crowded. 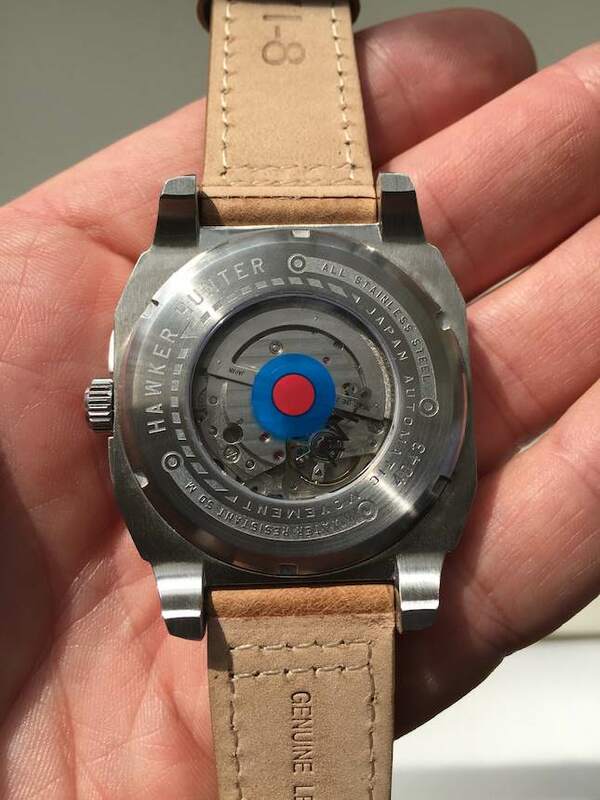 I really like what that same designer did with the subtle use of the color red on the AVI-8 Hawker Hunter. I’m guessing that in most flight instruments the color red is a warning indicator. So take notice that there’s a red triangle above the 0, around the date window as mentioned above and the small hand pointing in the 24-hour register. Even the hour markers on the left side of the dial are highlighted in red. None of these are overbearing like a flashing light, but add a layer of color that works. The original Hawker Hunter engine had a Rolls Royce jet engine and could fly 715 m.p.h. The engine in this watch is a Miyota 8217 automatic movement with the date and 24 hour functions has a vibration frequency of 21,600 vibrations per hour. This is a non-hacking Japanese movement, but unlike some other automatic movements from Japanese makers, this watch can be hand wound to give it the power it needs. 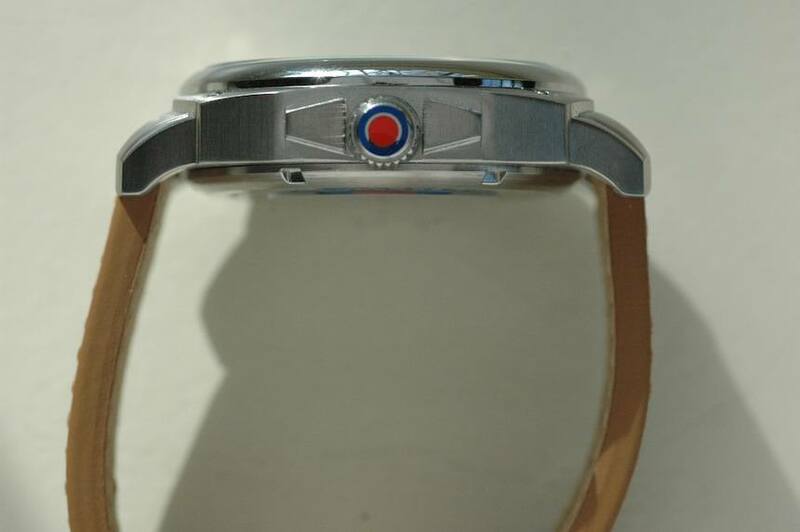 The crystal back lets you see this movement, but the British blue and red national insignia partially obstructs the view. Seems like a fair trade. The rest of the screw-down case back is engraved with the name and its movement’s origin as well as the 50m water resistance. The crown also proudly carries the British insignia like those used on their planes. I like this added touch. It is large and easy to grasp and winds smoothly. Setting this watch is pretty standard by pulling the crown out to the first position and turning it counter clockwise to change the date. To set the time, pull the crown to the second position and turn to set the hour and minute hands. Your 24-hour marker will turn at the same time and you’ll want to set it for AM (1-12) or PM (13-24). The 22mm leather strap is substantial and nicely stitched with the same color as the strap the dominant “vintage” color of the makers and hands. 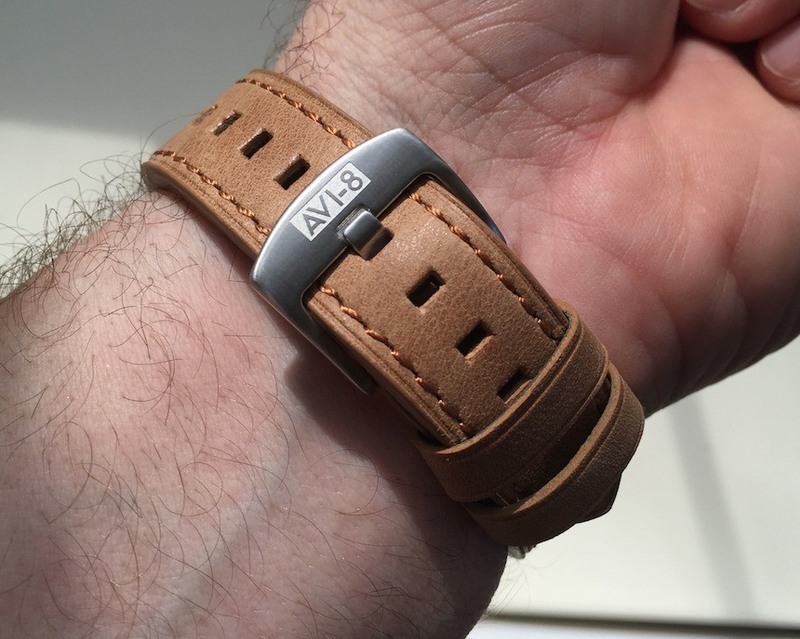 The satin steel buckle has AVI-8 engraved on it and rounds off the strap. I can easily see this watch hold a black leather strap too. 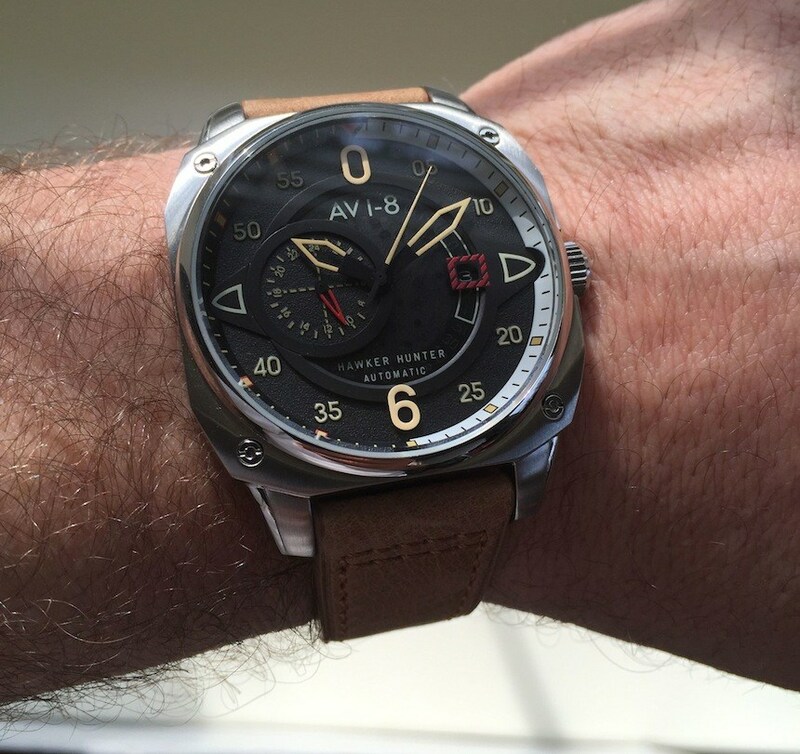 The AVI-8 Hawker Hunter is a comfortable watch for the large wrist-people out there. Out of the box, the strap went on easily, sized perfectly and held comfortably. It weighs nearly 100g but it did not feel too heavy for me. It’s a little bigger watch than I usually wear but I enjoyed the ride. I think this is definitely a casual watch for those moments and activities. Who we think it might be for: This is for the person who loves aviation themed watches and who likes the subtle style nuisances of each model that this brand offers. Would I buy one for myself based on what I’ve seen? : I would enjoy having an automatic from this brand especially the ones with the black dial. 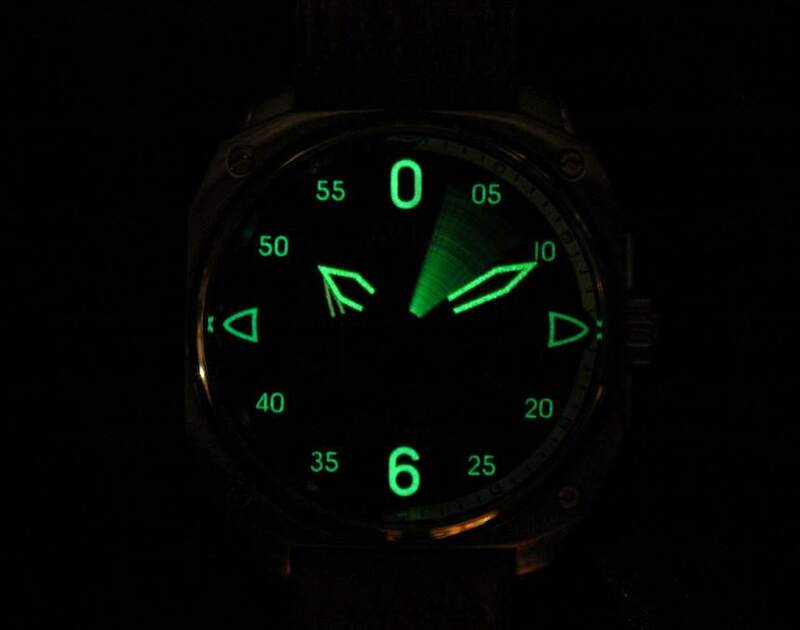 If I could make one design suggestion, it would be: I would look to bring more specific and obvious design elements from the planes into the watch designs. I don’t know if there’s a plane design in the watch of it is just the instrumentation look. What spoke to me the most about this watch: The size of the watch felt like I an aircraft instrument on my wrist. I enjoyed the size.